If you were designing a new crop for forest gardening, you might decide you wanted a starchy bulb rather than yet another leaf or fruit producer. Ideally it would be ready early in the season, before all the other roots. It would be nice if the bulbs tasted good, stored well, were a decent size and weren’t fiddly to prepare. Needless to say, it would have to grow in shade. It would also be handy if it was simple to propagate, maybe by dividing and self seeding modestly. While we’re at it, why not give it beautiful early spring flowers too? Erythroniums have an unusual growth habit: they only ever produce two leaves, which die down in June or July having produced one or hopefully more bulbs. A bulb is a wrapped-up plant, safely packaged and ready to go for the next year. The multiple layers of an onion bulb are the future leaves, while the little dense bit at the base is the stem. The tough outer layers are more leaves, modified to seal in moisture and keep out pests. With only two leaves, erythronium bulbs are noticeably different from this standard. They are long and narrow and have no outer skin, making them ivory-white, easy to prepare and a little prone to drying out if you aren’t careful with storage. 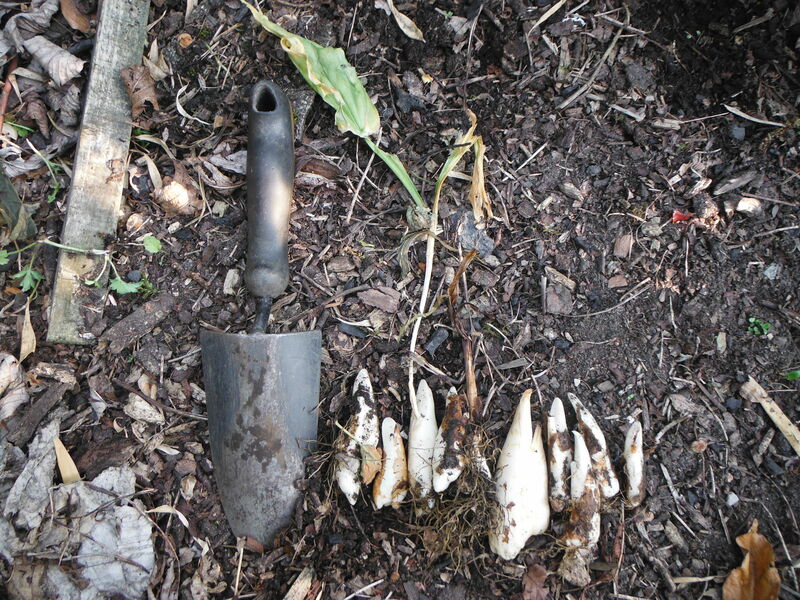 It’s a good idea to harvest dog’s tooth bulbs before the foliage has completely died down as they are then easy to find and you don’t have to dig around for them. They dry out easily so if you are storing them for a long period of time they need to be kept cool and moist. I get round this by only eating them in season. They are usually ready by the start of June so they fill the gap in the potato season nicely. I dig them up, take a proportion for eating and replant the rest as they will keep quite happily in the ground for the rest of the year. Such an early harvest gives an opportunity to use the ground for something else for the rest of the year. This could simply be weed control as you can hoe over the top of the dormant dog’s tooths so long as you have planted them deep enough. Alternatively you could sow a green manure or a quick crop like mustard greens or intercrop it with something like wild strawberry that uses the later part of the year and won’t interfere too much with the erythronium’s growth. Like most bulbs, dog’s tooths are adept at punching up through a thick layer of mulch, so I give mine a thick mulch of leaves in the autumn to both feed and protect them. 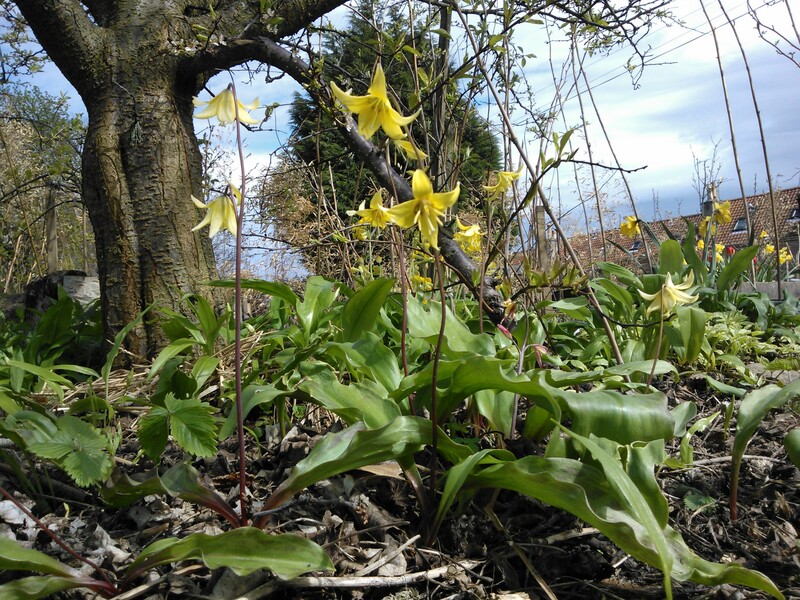 This entry was posted in Species and tagged dog's tooth violet, Erythronium, forest gardening, perennial vegetables, unusual foods. Bookmark the permalink. Interesting article on the use of these sometimes abundant plant. They are a bit on the tricky side for us to dig on our rocky acreage that they cover but I was thinking of seeding some under our forest/old orchard garden for later use. Wow, I had no idea they were edibe. Great article, thank you. You have inspired me to order some bulbs and try them in my orchard area. Another really interesting and useful post. Thanks Alan. They’re uncommon enough in the woods here in Kentucky that we generally don’t disturb them, tasty though they are. They are just so lovely to come across on an early-Spring day.